When referring to these birds, aviculturists often refer to them as Maximilian's Pionus, Scaly Headed Parrots, or the Scaly Headed Pionus. Any of these names are acceptable, although Maximilian's Pionus seems to be the most widely used. Maximilian's Pionus originate in the forests and wooded areas of South America, specifically in a range from Brazil to Argentina. Because of their popularity in the pet trade in recent years, however, the Maximilian's Pionus is kept in captivity in homes all over the world. The typical Maximilian's Pionus can reach lengths of up to 12 inches from head to tail at maturity, although it is more common for these birds to be in the range of 10 to 11 inches tall. A healthy weight for an adult bird of this species would be in the range of 8 to 9 ounces. Like all parrots, the Maximilian's Pionus can be expected to live for quite a long time. In fact, these birds typically live for up to 40 years as pets in captivity, and some can live for even longer. This is why it is so important for those who are thinking about adopting one of these birds to do plenty of research on the species before bringing one home. Caring for any animal for 40 years or more is a long-term commitment that should not be taken lightly. Those who own Maximilian's Pionus describe their personalities as fun-loving, comical, affectionate, and a little bit mischievous. Certainly, these traits can be true of all hookbills, but the charm of the Maximilian's Pionus seems to set them apart from even other Pionus species. They are known to be the best talkers among the Pionus, building impressive vocabularies and taking well to trick training. This could be because the Maximilian's Pionus enjoys spending quite a bit of time with their owners. Anyone interested in adopting one of these birds should make sure that they have plenty of time to spend playing, socializing, and interacting with their feathered friend. In terms of colorful plumage, the Maximilian's Pionus often gets overlooked in favor of more brightly feathered parrots. At first glance, these birds might appear dingy or even drab, but a closer look reveals real beauty in their coloration. The predominant color on these birds is a brownish olive green but is highlighted by a golden bronze type of sheen on their undersides. 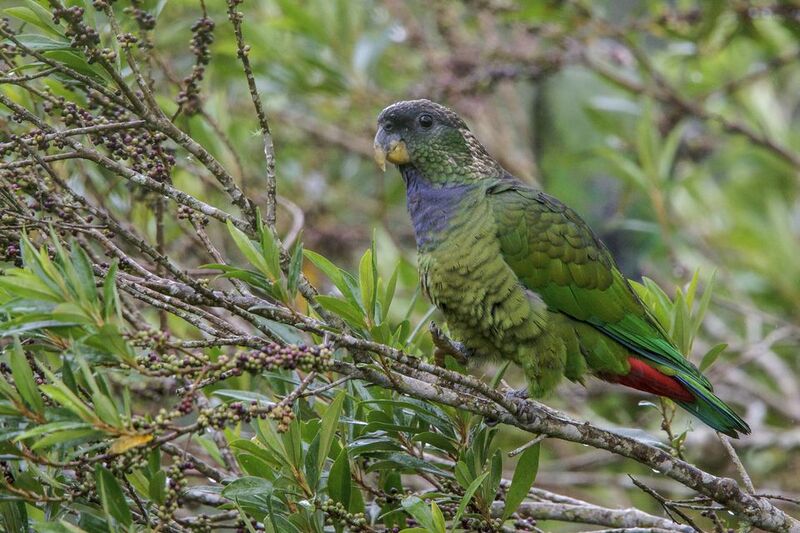 Their heads are covered in darker colored feathers edged in lighter gray, a feature which gave rise to their being called "scaly headed parrots" by some. The brightest parts of these parrots, by far, are their tails. The tailfeathers of a Maximilian's Pionus are a rainbow of green, blue, and red, adding the perfect finishing touch to these neat looking birds. Like other types of parrots, most Maximilian's Pionus do well in captivity when fed a high-quality seed and pellet mix, supplemented daily with fresh fruits and vegetables. Like some other types of birds, Maximilian's Pionus are known to be prone to obesity, so it is recommended to closely watch their intake of high-fat options such as sunflower seeds and nuts. They also need a higher intake of certain vitamins than other birds, particularly Vitamin A. To supply this, many who own Maximilian's Pionus make sure that their diet includes plenty of fresh, leafy greens such as spinach, romaine lettuce, and kale. Maximilian's Pionus need plenty of exercise in order to maintain the best physical condition possible. For more healthy birds, it's recommended that they are allowed at least 3 to 4 hours outside of their cage each day in a supervised, bird-proof setting. This gives them the opportunity to play, stretch, and make sure that all their muscle groups get a nice workout. Known as one of the more quiet bird species, Maximilian's Pionus might be a good choice for those who want a larger parrot but don't want to have to deal with the extra screaming and noise that comes along with a bird like a Macaw or Cockatoo. While they bore easily due to their high intelligence, Maximilian's Pionus who are kept properly occupied are known to make sweet and loving pets who thrive on the bond that they form with their owners. If you're interested in learning more about keeping a Maximilian's Pionus, contact a local breeder or a bird club or aviculture society in your area. These types of resources will offer you plenty of information on what it's really like to live with these types of birds and will assist you in your decision to adopt one if you decide that a Maximilian's Pionus would be a good fit for your family.